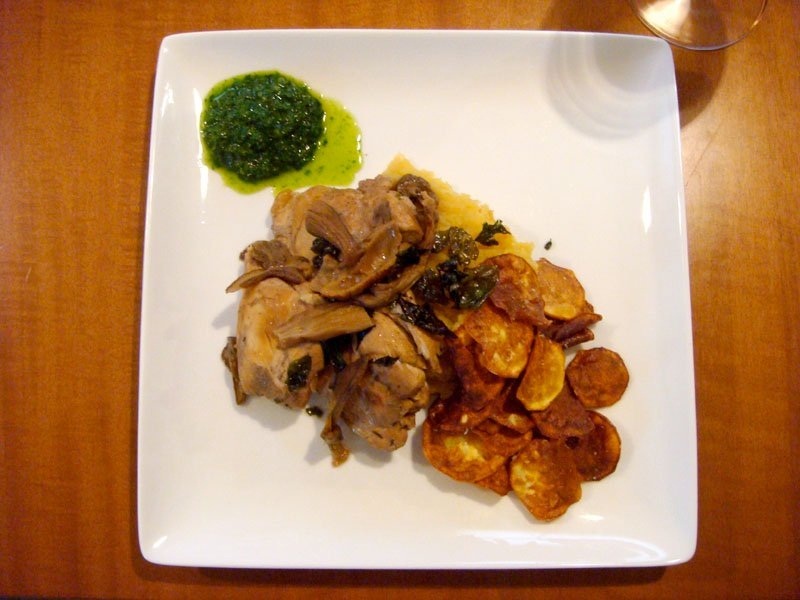 Porcini-Braised Chicken Thigh With Sweet Potatoes Two Ways — Top Chef Masters Night | Eat.Drink.Life.Love. When you have a busy week, the best word you can find in a recipe is “braised.” It means we can bust out the crock pot, throw in some food early in the day and let everything simmer away for dinner that’s ready when we are. Last week we went to a movie, a Twins game (they lost — big surprise), I had a guitar lesson, a girls’ night dinner and we also attended an awesome MN Food Bloggers event on the patio at Heidi’s**. To make sure Top Chef Night gave us a breather, we went with Naomi Pomeroy’s Porcini-Braised Chicken Thighs With Sweet Potatoes Two Ways (click here for recipe). There were no skin-on, bone-in chicken thighs (called for in the recipe) at the store so we went with the skin-off, bone-out variety. And instead of being all fancy about it, we used boxed chicken stock instead of making our own. When you’re only using it as braising liquid and then tossing it, I don’t think it’s worth the time to make stock from scratch. Because our chicken didn’t have skin, I did not saute it before putting it into the crock pot. I did, however, reconstitute the dried porcini mushrooms in hot water before dumping it all over the chicken, adding some thyme, whole cloves of garlic and a splash of white wine before covering everything with the chicken stock. Then, in the immortal words of Ron Popeil, I was able to set it and forget it. When we got home, K got to work on the sweet potatoes two ways — cutting and boiling some and slicing a few very thinly on the mandolin. I mixed a chopped up chili in adobo sauce with some soft butter, cinnamon and paprika and, after he’d mashed the potatoes, K added the butter to the puree. While I blended chervil, chives, parsley, shallots, sherry vinegar and olive oil in the food processor, K fried the thin slices of sweet potatoes and salted them while they drained on a paper towel. He also fried some parsley which caused the oil to spit angrily and the parsley to shrink and turn brown. It only took about 30 minutes for everything to be ready! Overall, it was … okay. Good, but nothing to rave about or serve at a party. The chicken was juicy and tender, but a decidedly (and unappetizing) greyish brown color. Greige, if you will. K referred to the sweet potatoes as “baby food,” but I didn’t mind their texture. They just could have used more flavor. Maybe more of the chipotle spice butter. The fried sweet potatoes, however, were a big hit because who doesn’t love freshly fried and salty potato chips? The mushrooms added a nice earthy meatiness to the mix and the herb mixture offset that with a bit of fresh and tart. All in all, a decent dinner, but nothing worthy of a second go-round. Perhaps if we’d stuck more closely to the recipe this would have wowed us more. Alterations: We used boxed chicken stock instead of making our own and didn’t use veal stock at all. We used skinless, de-boned chicken thighs and because of this, we did not saute the thighs at all. We used the crock pot instead of braising in the oven. Soundtrack: The soundtrack from “The Book of Mormon” was floated, but I wasn’t into it so we stuck with late ’80’s/early ’90’s like Joy Division, New Order and The Cure. Would we make this again? Meh, probably not. ** A HUGE thanks to the crew at Heidi’s 2.0 for hosting the May MN Food Bloggers event on their lovely patio. They fed us well and a good time was had by all. It was lovely to meet many of our fellow local food bloggers and we look forward to meeting even more of you in person soon!